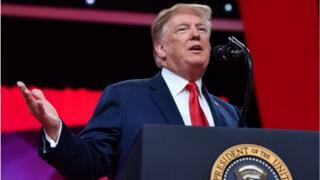 A US House panel investigating alleged obstruction of justice and abuse of power by the White House has sought documents from 81 people and groups. The House Judiciary Committee released the names on Monday of aides to Donald Trump and his campaign, members of his family, his business and others. Among those who received requests from the panel are Mr Trump's sons, the FBI, the Trump Organization and Wikileaks. It comes as the panel's chairman said it was "clear" Mr Trump broke the law. On Monday, House of Representatives Judiciary Committee Chairman Jerry Nadler said that it is the "obligation" of Congress to "provide a check on abuses of power" by the White House. 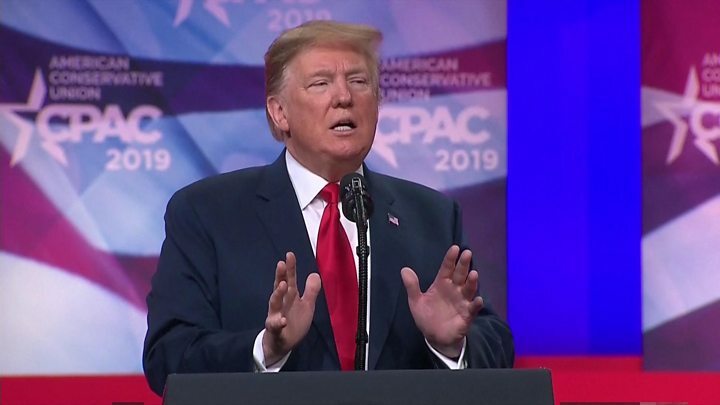 "Over the last several years, President Trump has evaded accountability for his near-daily attacks on our basic legal, ethical, and constitutional rules and norms," he said. "This is a critical time for our nation, and we have a responsibility to investigate these matters and hold hearings for the public to have all the facts," he continued. "That is exactly what we intend to do." In a brief statement on Monday, press secretary Sarah Sanders said: "The House Judiciary Committee's letter has been received by the White House." "The counsel's office and relevant White House officials will review it and respond at the appropriate time." She did not reveal the names of any of the officials who have received letters from the Democrat-led committee. A counsel for the House Judiciary Committee said in a phone call with reporters on Monday that document requests have been sent to 81 people and organisations. The documents will be used by the committee to determine which witnesses to call to testify in the coming months, according to the official. If they do not comply with the next few weeks, subpoenas will be issued. Jerry Nadler, a Democrat who has served in Congress for more than a quarter century, isn't messing around. With his announcement of document requests to 81 individuals and entities - some members of the Trump family and inner-circle, others only tangentially related - the chair of the Judiciary Committee is taking a shotgun approach to his investigations of the president. Mr Nadler outlined three areas of investigation - obstruction of justice, public corruption and abuse of power - but it's hard to imagine any presidential controversy or scandal that falls outside these broad parameters. Although the press release announcing the investigations doesn't mention Russia or its election-meddling by name, the key components of the collusion allegations - the 2016 Trump Tower meeting, the WikiLeaks email dumps, changes to Ukraine policy in the Republican Party platform and the Trump-Russia business dealings - are all over the document requests. Mr Nadler puts a tight deadline on the request - just two weeks from now - although the initial inquiry is limited to documents already produced for other government investigators. It will be a good test to see exactly how co-operative the Trump White House and its former and current officials will be before the real investigatory squeeze begins. Trump Organization chief financial officer Allen Weisselberg, longtime Trump personal assistant Rhona Graff and ex-White House counsel Don McGahn are also on the list of names released by the committee. Donald Trump Jr has previously been forced by members of Congress to answer questions about a June 2016 meeting at Trump Tower, in which he sat down with a Kremlin-linked lawyer who had offered dirt on Mr Trump's opponent Hillary Clinton. Wikileaks, and its founder Julian Assange, have also been sent documents requests by the committee. Wikileaks published emails stolen from the Democratic National Committee and released them during the 2016 campaign, causing political embarrassment to Mrs Clinton and her campaign team. Roger Stone, Mr Trump's confidant, who is currently under investigation by Special Counsel Robert Mueller for allegedly lying to prosecutors about his communications with Wikileaks during the presidential campaign, is also receiving a request from the committee. After Mr Stone's arrest in January, he denied that he played a role as an intermediary between the campaign and Wikileaks. On Sunday, Mr Nadler called it "very clear" that the president had obstructed justice. But Mr Nadler, whose committee is charged with conducting impeachment hearings, told ABC News it was too early to discuss removing the president from office. Speaker of the House Nancy Pelosi has said lawmakers must allow Special Counsel Robert Muller to complete his probe into whether Russia colluded with the Trump campaign and obstruction of justice before the idea of impeachment can be discussed. Republican Kevin McCarthy accused Democrats of playing partisan politics, telling the Associated Press on Sunday that "Congressman Nadler decided to impeach the president the day the president won the election". Democrats, who took control of the House of Representatives in January, have vowed to open investigations into the president and White House. More than five House committees are now investigating alleged Russia meddling efforts in 2016, the president's tax returns and potential conflicts of interest involving Mr Trump's family.